“The Dragon In Me” tells the story of Michael and his love for Dragons. “Dragons are very strong,” said Michael. “They can also fly, breathe fire and do lots of cool things. This wonderful story helps kids to find and control their inner strength while encouraging them to discover the power of imagination. Michael’s Mother shows him how he can operate his inner Dragon to overcome any obstacle. 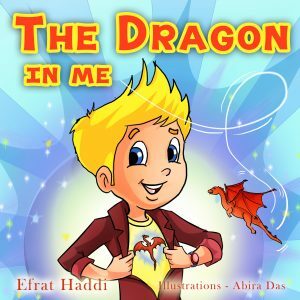 Author Efrat Haddi is taking young children on a journey with Michael while he learns how to operate his inner Dragon and overcome almost any problem. “My Inner Dragon” helps to teach children an important social skill that can make home life happier and school more successful. It also provides parents, teachers, and counselors with an entertaining way to teach children their inner strength. This well-written and inspiring story, delivers easy-to-digest education complemented by vibrant, delightful illustrations. Efrat haddi is a mother of three children with extensive experience in education and love for kids . In recent years, she is working with children in a democratic school in Israel where democracy is both a goal and a method of instruction. Democratic education brings democratic values such as justice, respect and trust to education, and includes self-determination within a community of equals. In her books she combine her life’s experiences with diverse knowledge accumulated while working with kids over the years, all in a sensitive, positive and inspiring way. Her books are always filled with fun, and fun pictures.